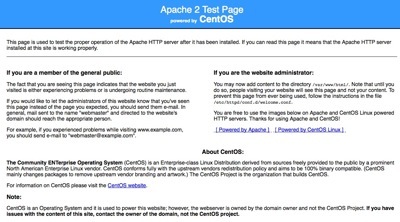 Now point your browser to http://localhost and you shouldn't see any Apache Test Page again. removing the test wont affect anything except the welcome page. Hi, i have a problem… i have read your recommendations, the issue is that we donÂ´t have that files that you mention (the folder call “test” was erasure)  but i still  have the test page on my site. We have install wordpress a few days ago with the respective coming soon page and i was right and now we have this APACHE page, and we donÂ´t know what do to have our page back. We donÂ´t have any idea abut apache, and we dont have this: /etc/httpd/conf.d/welcome.conf .. we dont know if this is because the folder “test” was remove. Thanks – it worked for me! I’m sorry but it doesn’t work for me, if I comment the lines in welcom.conf file it still shows the Apache Test Page. And even if I add an index.html file in /var/www/html the result is the same. How can I get rid of this page and put the one that I want? By default if you comment out welcome.conf you get a browser page showing the index of the http root folder (I’m using CentOS 5.5 with Apache 2.2.3). Most folks probably don’t want this. This creates a blank index.html file and when you browse the site you just get a white screen. Another benefit of this method is you don’t have to restart Apache for it to take effect.